NoteVault was founded to develop and deploy innovative mobile solutions for construction and infrastructure projects. NoteVault's reporting system enables users to simply 'call in' notes. Each note is then transcribed and automatically emailed, along with photos as a PDF Daily Report to project stakeholders. NoteVault's software as a service "cloud" based solution enables the "boots on the ground" to capture detail from a project site in real-time. Founded in 2007, we are the original and most trusted Daily Reporting software in the industry. Require your employees and contractors to use NoteVault, and stay informed about issues on your jobsites. 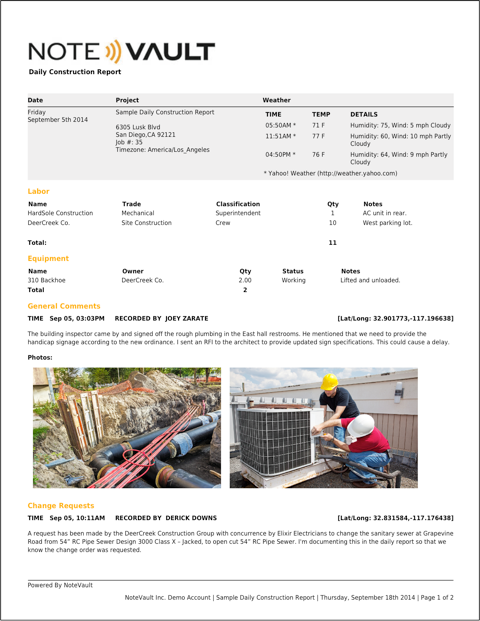 Receive PDF reports daily and view project status from your desk. Plus, you can share your reports with your team, and automatically store them in Box or SharePoint. Stay organized and informed to protect yourself from unexpected claims or disputes over the project scope, schedule or costs (or a combination of these). You get an independent record of events that provides long-term protection; encrypted and stored for 10 years in NoteVault’s secure “cloud” based storage. Expand your inspector base by involving everyone on your project team in reporting safety observations. NoteVault keeps you and your team in the loop with simultaneous phone calls, text and email messages to designated stakeholders in the event an incident is reported. Read more about how to improve safety using The Safety Triangle. Always be informed of issues, accidents, or delays with your daily NoteVault report delivered every morning to your email. Receive PDF reports daily and view project status from your desk. Plus you can share your reports with your team and automatically store them in Box or SharePoint. Create a safer work place and expand your inspector base by having ALL of your project team involved in reporting safety observations. NoteVault places simultaneous phone calls, text or email to designated stakeholders in the event an incident is reported. Read more about how to improve safety using The Safety Triangle. With NoteVault, you get professional daily reports from your entire team. It’s simple and easy for everyone to speak their notes into one project, saving hours of admin time and ensuring your projects are accurately and professionally documented for your protection. Keep on top of repairs, assigned work tasks, and corrective actions with your daily report from the entire project. Document needed repairs and receive automatic notifications when completed. Use NoteVault to expand your “inspector base” by having ALL of your project team involved in reporting safety observations in addition to safety inspectors. NoteVault places simultaneous phone calls, text and emails to designated stakeholders in the event an incident is reported. Read more about how to improve safety using The Safety Triangle. Always keep management informed with your daily NoteVault “news” delivered every morning with their coffee. Plus you can share your reports with your team and automatically store them in Box or SharePoint. Give your superintendents an extra hour a day by letting them speak their daily reports and capture photos throughout the day. Best of all, you receive a collaborative PDF report daily as all your superintendents enter reports directly into NoteVault. With NoteVault, foremen spend their valuable time supervising because they stay on the job site and can satisfy company requirements for DCR’s. Take pictures of time cards, delivery tickets, inspection notices, and document RFI’s and change orders. Document labor activities, materials put in place, and equipment utilized, providing detailed records to track production data. Voice notes can provide such rich detail that anyone understands what is needed to correct the deficiency, getting it right the first attempt. Inspectors dictate notes and capture photos about quality issues. Plus, anyone can get an automatic notification that an item is complete. Use NoteVault to expand your “inspector base” by having ALL of your project team involved in reporting safety observations in addition to safety inspectors. NoteVault places simultaneous phone calls, texts and emails to designated stakeholders in the event an incident is reported. Read more about how to improve safety using The Safety Triangle. Keep management informed with your daily NoteVault “news” delivered every morning with their coffee. Provide reports daily and view project status. Plus you can share your reports with your team, and automatically store them in Box or SharePoint. Give your superintendents an extra hour a day by letting them speak their daily reports and capture photos throughout the day. It’s simple to keep track of production labor, materials, and equipment. Best of all, you receive a collaborative PDF report daily as all your superintendents enter reports directly into NoteVault. Voice notes can provide such rich detail that anyone understands what is needed to correct the deficiency, getting it right the first attempt. Inspectors dictate notes and capture photos about quality issues. Repairs are completely documented. Plus, anyone can get an automatic notification that an item is complete. With NoteVault, you get professional daily reports from your entire team. It’s simple and easy for everyone to speak their notes into one project, saving hours of admin time and ensuring that projects are accurately and professionally documented for your protection.